What really is the value of a mile? 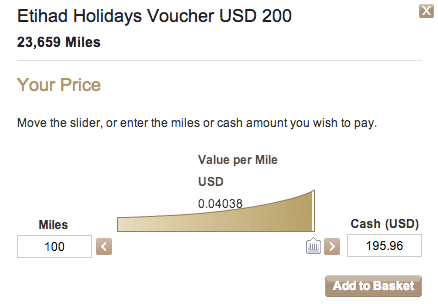 A few days ago I tried to talk about how it’s very difficult to value a mile especially with hotel redemptions. It will differ for everyone. I personally use the lowest price you would have paid on a redemption to evaluate the value of my redemption. I think miles sitting in your account is extremely difficult to value because in my opinion there’s no value that I would feel is equivalent to cash in my pocket unless you’re actually buying the miles at the very pricey cost that the airlines/hotels will generally sell them to you at. I personally use a price range valuation which means that the maximum any mile is worth to me is the maximum price that I can pay (and am willing to pay) for it (or another currency to redeem much of the same miles). This means for me Aeroplan miles are worth a maximum of 1.88 cents (if not less) since you can buy US Airways miles at the price as well as Lifemiles for 1.5 cents. The minimum value is if I convert something similar to cash (gift cards, prepaid visa, etc.). That means my cost to acquire miles is only worth it if the amount is below the minimum. So for a 15,000 Canadian credit card signup bonus with $500 minimum spending, and waived annual fee. That means the 1-2% cashback I’m missing out on (~$10) and the credit pull (~$50 or less) I’m losing out on makes the cost to acquire the miles less than 0.5 cents per point. You can redeem for gift cards with Aeroplan at around 1 cent per mile in the worst case scenario, which is why credit cards are such a great way to acquire miles. Today I thought I’d bring up something that is throwing my mind completely off, which is redemptions by Etihad Guest.They have a horrible program for flight redemptions compared to US programs, but their merchandise redemptions are pretty interesting, because you can use cash and points to redeem for those, only requiring a minimum of one mile. What’s really interesting is that they even tell you the value of your miles. On their Etihad Guest Rewards shop website, you can redeem for a lot of different merchandise. I’ve been trying to find redemptions where they don’t put big markups on the cash price, and the closest I’ve gotten is a face value $200 USD Etihad Holidays Voucher for $200. So let’s say that you actually wanted that (I’m sure that a lot of you don’t really want it, but let’s just imagine for the sake of evaluating). 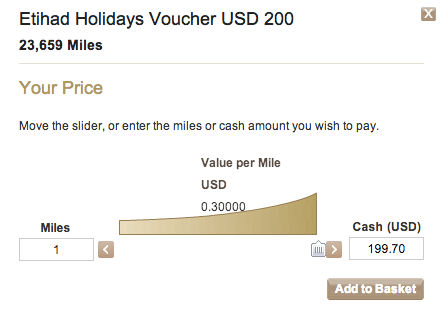 This means you’re getting under 1 cent per point on this redemption (200$/23659miles). But if you’re only using 100 miles and cash, then the your cent per mile redemption rises to 4 cents! You’re getting 30 cents per mile! Yes, you are getting $0.30, but only for one mile… and it costs you $199.70 to do it. Doesn’t really seem worth it. I guess what would you have to add to your calculation is a variable for how many miles you need. If you are getting 30 cents/mile, but only need/use one, then that credit card deal to get the single mile isn’t very attractive. Etihad’s cash and miles option is pretty good, you can upgrade to business class even with discount ticket! Also they are now partner with Hainan airlines, one way economy class is only 3500 Etihad miles if the distance is under 500 miles. Lots of fuel surcharges unfortunately.